The G8LED professional-grade 900-watt grow light, which was chosen as “Gear of the Year” by High Times Magazine, covers a penetration depth of 60 inches below the plant canopy and an area of over 24 square feet. Its main advantage is that it offers the same growing power as a 1400W HPS, for which you would be paying twice as much in electric bills. 0.2.1 Why Is The Light So Reliable? This product has been on the market for 8 years, and its service and results are proven time and again. 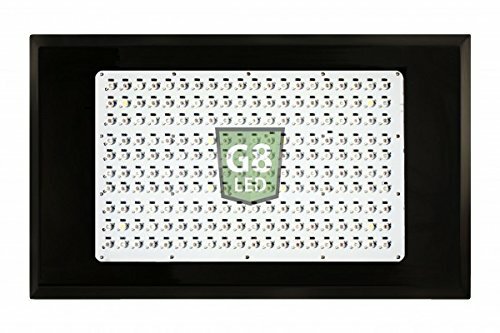 G8LED technology is green technology, offering impressive, high-quality optimal 8-band wavelength Ratio plus real UV and IR for the most efficient grow light setup. It’s cool to the touch even after you have been using it for 24 hours. Another advantage is that the LEDs are made and tested in the USA. This is especially important for people who want to support American technology and industry and also don’t want to wait for spare parts or replacements to arrive from China. Not that you’ll need to worry about spare parts – this product has gone through several iterations over the past (almost) decade, and we enjoy the best quality, most innovative indoor grow lighting technology possible as a result. G8LED lights produce top quality plant growth and the biggest yields in the industry. The performance and quality of this light is unparalleled. To maximize yield, we recommend adding two 90W Red Flower Boosters during flowering. This light’s operational range is from 110V to 240V. The product comes with hanging wires. LED lights last up to 50,000 hours, outlasting HPS lights by more than 200% of their maximum life expectancy. 50,000 hours is equivalent to 15 plus years of growing. G8LED uses only 3-watt LEDs because that size is most efficient at penetrating down to the bottom of the plants. It’s intended to generate the best growth during the vegetative and flowering stages. Every part of the light works in these two stages. There are no optical lenses reducing the power of the LED output, and no light goes to waste. This is why the G8-900 is able to cover such a large area. This setup utilizes LEDs from BridgeLux, Epistar, and Optotech among other well-known and reputable manufacturers. Why Is The Light So Reliable? The panel has zener diodes to protect from failure and surges from burnouts. The fans mounted on the top side of the panel generate warm air, but they won’t burn the plants – the LEDs still run a lot cooler than traditional lights. Don’t put the light too close to the plants, because it is very strong, discolor them and stunt their growth. The manufacturer recommends hanging the panel 26 to 42 inches from the canopy of the cannabis. The maximum is 42 inches if you want taller plants, and the minimum of 26 is for shorter, bushier ones. This light weighs 23 pounds. You will need 4.6A at 110V or 2.2A at 240V. G8LED offers a 90-day money-back guarantee, and the G8-900 comes with a two-year warranty. If you have an issue, they service the lights themselves. This light truly is a lucrative investment for your indoor cannabis growing business or hobby – nothing can replace a genuine G8LED indoor grow light. Keep the LED on 18 hours a day in the vegetative cycle because this imitates the summer season and encourages your plants to grow faster, soaking up the light, so you can then clone them. Keep it on for a period of a month to a month and a half. You’re ready for the next stage when you start to see signs that flowers are coming, i.e. flowering stage. In the second, flowering stage, the LED should not be on for more than 12 hours a day. Your flowers should start to bloom in up to 2 weeks. If you want, you can add an all-red grow light at this time. The flowering cycle continues for up to two months. In this stage, we recommend fertilizing the plant lightly with more potassium and phosphorus and less nitrogen. As you will need less fertilizer with LED grow lights compared to HPS or MH, you’ll save more money. Wait for the weed to finish flowering before you start to harvest. It’s very important to be patient. How would you know it’s finished? The pistils get bigger and their color changes – from white to reddish-brown. If you’re replacing a traditional light system or expanding your production, the G8-900 is the best option for you. Growers from all parts of the globe are reporting excellent yields with this panel. It is definitely a wise and lucrative investment, and we recommend it highly.